Published on June 14, 2012 by cara.b.b. hi friends. back today with a few party tricks. these are not rocket science, just a few things i’ve picked up along the way from parties i’ve been to, pictures i’ve seen, and of course, pinterest. stick with a color scheme – everything will feel like it belongs and your party will have a flow. ours started with the napkin below – navy, light turquoise, and green, and i tried to keep everything pretty close so it would all work together. serve a signature drink in a large dispenser. this works especially great for a large group. everyone can help themselves, and you’re not stuck mixing drinks. 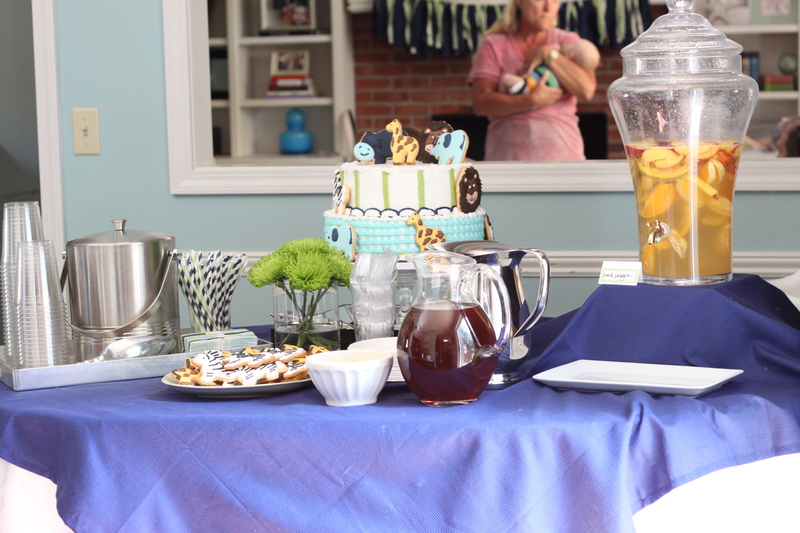 we served peach sangria (on the right), and it was a huge hit. 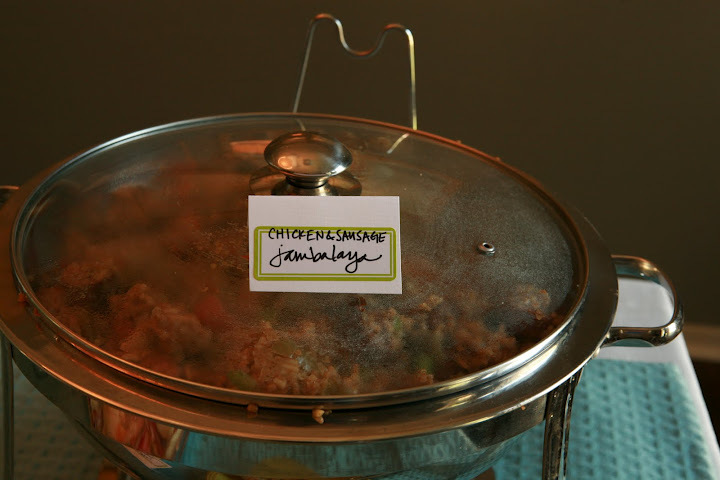 personalize it – if your party is in honor of someone, pay a little homage to them. 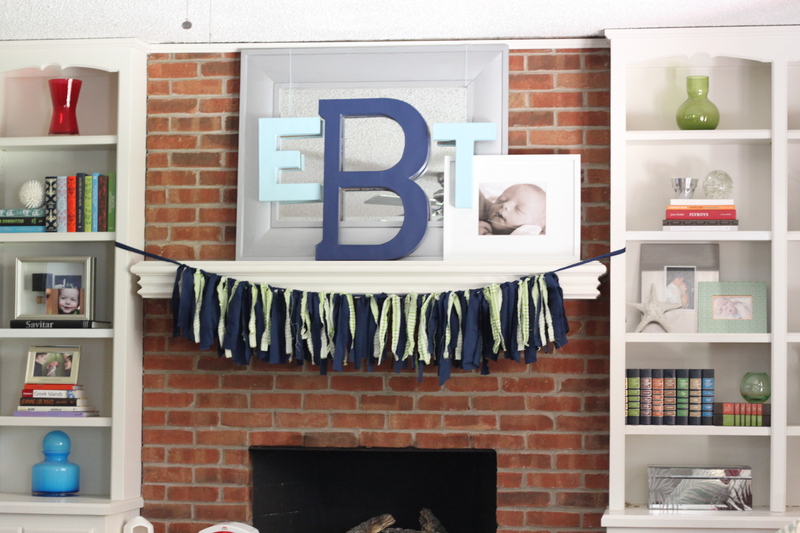 for instance, we put up emmett’s monogram and photograph on our mantle. do you have any fun party tricks? i’d love to try them out for my next shindig, so please leave your ideas! I have mostly white serving platters. Depending on what the color/theme is, I wrap empty boxes (I get a ton from amazon that are wide and short) using solid wrapping paper and use each one as a stand for a platter. They add a bit of depth/height to the table and pops of color. This works really well as a cake stand for a tiered cake. For a shower I had two boxes as tiers under a 3 tier cake. It was a small cake but with the additional height of the boxes, it stood out as the centerpiece of the dessert table. The 2 boxes almost looked as if they were tiers of the cake. Love the first photo. 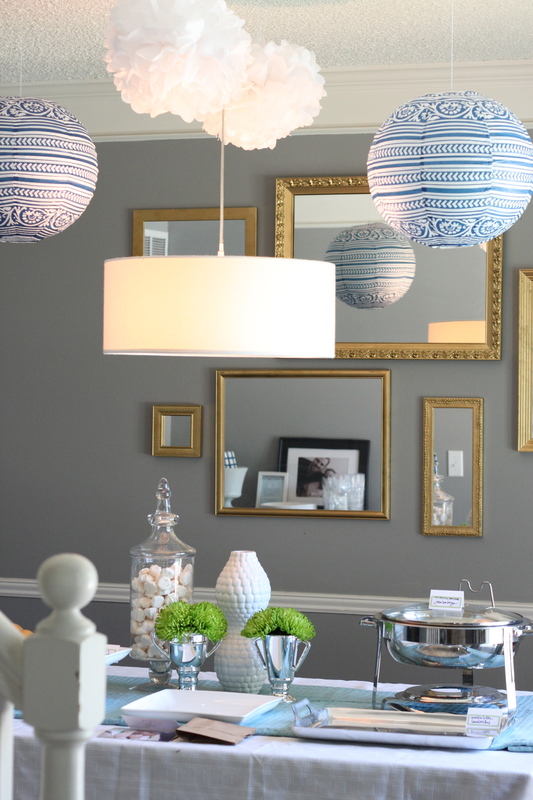 Those blue and white lanterns (and your gold mirrors) are great!